Poonch: Awake India arranged a 'Mehfil-e-Mushaira in the memory of late Mehmood-ul-Hasan Mehmood, the Urdu poet, to pay tribute to his poetic genius and contribution to Urdu literature. 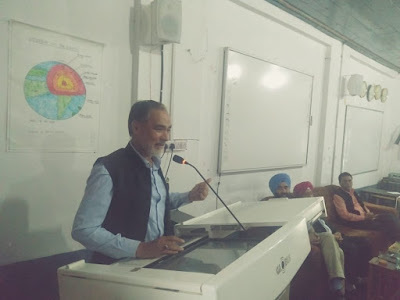 The programme was attended by renowned poets and other prominent figures from J&K. The Mushaira was presided over by a well known poet of Pir Panjal Khursheed Kirmani and proceedings were conducted by Dr. Amjad Ali Babar. 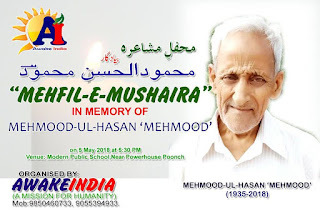 While reading out the welcome address, Ayaz Mughal, Chairman Awake India underlined the importance of such literary functions and threw light on the life of Mehmood-ul-Hasan Mehmood and his contributions to the Urdu literature. Nazak Hussain Shah, presented a research paper on the life and works of Mehmood-ul-Hasan Mehmood. A book titled "Auj-e-Khayal" which is a compilation of poetry by Masood-ul-Hasan 'Masood' was also released by Jahangir Mir, Ex Deputy Chairman Legislative Council and K. K. Kapoor. The poets including Pervez Malik, Sajjad Poonchi, Ayaz Saif, Haroon Rathore, Mujahid Mughal, Amjad Ali Babar, Mohtshim Ahtsham, Nazarat Fareed, Alamdar Adam, Hafiz Riaz Mir, Khalil Reshi, Sadeeq Ahmed Sadeequie recited poetry. Jahangir Hussain Mir, Ex MLC, Keval Krishan Kapoor, Rtrd DEO, Sajjad Punchi, Sanjeev Sharma(Vicky), Prof. Shafiq Chowdhay, Prof. Aziz Chohan, Prof. Shahid Zafar, Ashiq Rafiq(KAS), Waheed Ahmed(KAS), Asad Chohan, Khalil Bandey, Nusrat Shah, Pervez Afridi, Sajad Kafiel, Adalat Khan, Asif Lone, Tariq Chugtai and other prominent personalities were present on the occasion.